This jet engine sound generator circuit is based on the sound generator IC HT2844P from Holtek Semiconductors. This particular IC can make four sounds namely low speed sound of jet engine, high speed sound of jet engine, missile sound and machine gun sound. Each of these sounds can be activated by connecting the pins 12, 13, 14and 15 to ground by using the respective push button switches. Resistor R3 can be used for manually increasing or decreasing the speed.LED D1 gives a visible indication of the sound. Do not give more than 3.3V to the IC. K1 can be a 200mW/8 Ohm speaker. 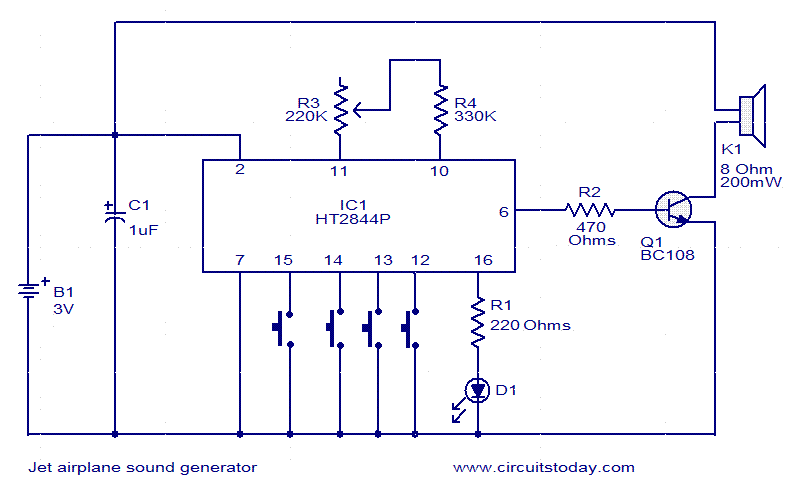 Can this circuit run ?? I want to know which board is perfect for given circuit connection.. This chip seems to have disappeared, where can I get one,please. Yes all the components are available in the electronic spare market. you can assemble on universal board and use IC socket for the IC. Do not insert IC into the socket till you finish soldering and through checking of the wiring. hello sir,can we get all the components required for this?how much this circuit costs? Hi Noel there is no substitute for these ICs as they are ROMs programmed at the IC manufacturer’s works. Hi Patrick you can use Peizo buzzer in place of speaker. use the one which can work down to 2.7 volts. Can I use a Peizo Buzzer, instead of a speaker?? Hi Steven Wish you all the best, the following site you can visit for mfg. data. thanks seetharaman..wish me luck in building this one..children will like this one..
Hi Steven Yes you are correct no connections. thanks for the reply seetharaman..so other leg of R3 is hanging? ?am i right?? Hi Steven it is not to be connected. R3 is used as a rheostat (variable resistnce) not as a potentiometer. hey..may i ask the connection of the other leg of the R3? ?